UTM (all in one) firewall not in good shape! If you are concern cyber security, please forget so called cost effective solution. Preface: Dynamic memory automatically reclaimed when the garbage collector no longer sees any live reference to it. 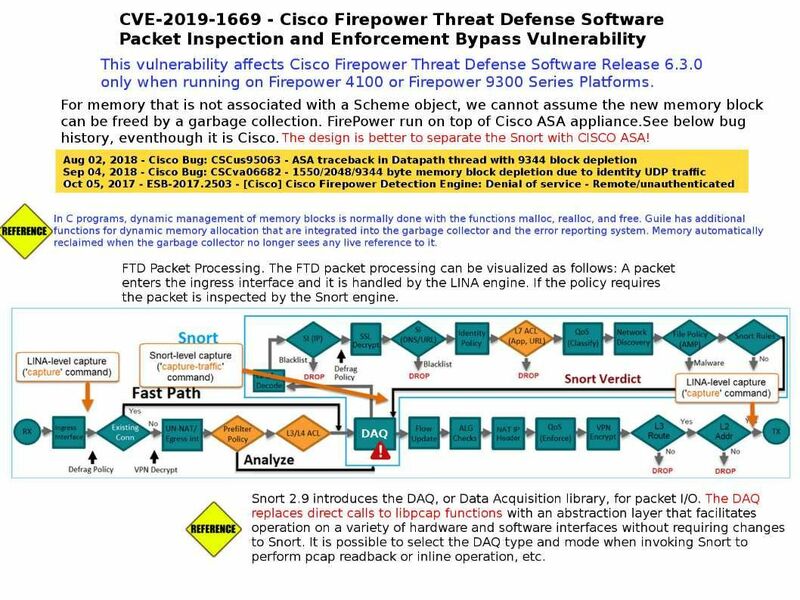 Description: A vulnerability in the data acquisition (DAQ) component of Cisco Firepower Threat Defense (FTD) Software could allow an unauthenticated, remote attacker to bypass configured access control policies or cause a denial of service (DoS) condition. My opinion: For memory that is not associated with a Scheme object, we cannot assume the new memory block can be freed by a garbage collection. FirePower run on top of Cisco ASA appliance.See below bug history, eventhough it is Cisco. The design is better to separate the Snort with CISCO ASA! Previous PostA specially crafted username through phpmyadmin can be used to trigger an SQL injection attack through the designer weakness – 30th Jan 2019Next PostThe vulnerability of the Internet of Things 4.0 has attracted the interest of the APT Group in the enemy country.